Below is a photo of a toolset I bought for $7 at a "stumpemarked" (open marked for classic bike and car parts) in Gjern, Denmark last weekend. What i don't know is what is the tool on the far left for? 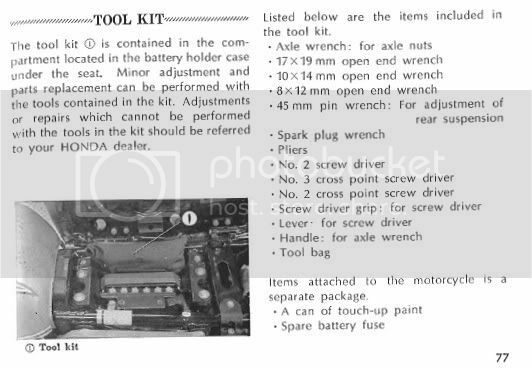 I think it is the original toolset for a 70ties Sohc/4 Honda. It will fit perfectly under my refernished seat when it is finished. '78 CB550K3 beautifull but engine needs rebuild. It might look like a spokewrench but then it isn't for my CB550. The wrench opening is 8 mm and far to wide for my spokes. Maybe it wasn't a part of the original toolset or maybe the toolset is not originally for a sohc/4 Honda? Education: Elitist activity. Cost ineffective. Unpopular with Grey Suits. Now largely replaced by Training." If it's 8mm then I'd say you're probably right. That's also the size of the brake bleeder valve. easily worth $40 on Ebay.... complete Honda toolkits do very well. Good bargain!!! I use it for removing/replacing the main jets. Looks like the shock adjustment wrench is all that's missing. That funky wrench on the left also serves at the handle for the sparkplug wrench. That funky thing is the extension handle for the axle wrench. The spark plug wrench has a hole to use a screwdriver blade for torque. The other strange one near the middle attaches to the end of the screwdriver blades for torque if the normal handle is insufficient and you need more force to ruin a screw head. Check that the axle wrench fits your axle nut: there are several different sizes for different modlel bikes and there's no guarantee this set is for yours. i'll buy the whole kit with pouch off of you and that will solve your delema! The axle wrench handle is on the right, meant to slip over the axle wrench itself. I was referring to the wrench in question. I don't know about the tool in question, but I think the Honda tools remained the same for many years and most models. The original tools that came with my 1965 Honda look the same as the ones in the photo above (minus the odd small wrench). And the best part is they are still available from Honda for one or two dollars each. I've seen the whole kit, brand new, for 20 dollars including the pouch, but I think the part number for the pouch has changed. Looks like it fits the front axle. Have to check the bolt size though, I think they're 8mm. Only thing I have ever used it for is to loosen or tighten the spark plugs. I use it through tthe holes in the top of the spark plug wrench. Speaking of...mine runs great! Thanks to you and those jets. How's the new $10,000 engine project coming along? That same tool is in my 350f kit and I have never figured it out. would it fit the top adjusting nut on the carbs to sync the slides ?? na they are 14mm aren't they? Might be a multipurpose tool, also used to knock on gas tank to check fuel level.